Born in England and raised in Canada, John Byrne discovered super-heroes through The Adventures of Superman on television. After studying at the Alberta College of Art and Design, he broke into comics first with Skywald and then at Charlton, where he created the character Rog-2000. Following his tenure at Charlton, Byrne moved to Marvel, where his acclaimed runs on The Uncanny X-Men and The Fantastic Four soon made him one of the most popular artists in the industry. In 1986 he came to DC to revamp Superman from the ground up, and since then he has gone on to draw and/or write every major character at both DC and Marvel. CBR: Comic Legends - Superman & Wonder Woman Nearly Had a One-Night Stand? Comic Legends: Superman & Wonder Woman Nearly Had a One-Night Stand? Welcome to Comic Book Legends Revealed! This is the six hundred and fourth week where we examine comic book legends and whether they are true or false. This week, it’s all Superman-related legends! COMIC LEGEND: There was almost a one-shot comic where Superman and Wonder Woman had a one-night stand. It was then teased in a couple of other comics, including a “DC Comics Presents” issue where Eros made them fall in love with each other. It then became a team-up where they fought against Darkseid because, hey, it’s comics, you have to have a fight scene! Also on my Wonder Woman agenda is a one-shot prestige format book tentatively titled “Rendezvous”, and it is a romance story with Diana and Superman to be edited by Karen. It will, at last, really deal with the physical relationship between these two popular characters. In other words, they do it. Due to the nature of the story, I will probably be using the Gods as a means of allowing the reader his or her option to regard or disregard this tale as part of DC continuity. I have no intention of treating this story sensationally, but there are definitely some mature themes I’ll wish to explore. 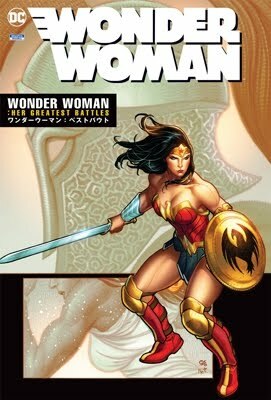 Recently, at this year’s Dragoncon, during a Wonder Woman panel, Perez restated that he had started on plans for a one-shot graphic novel along those lines, but it didn’t end up materializing. At the Dragoncon panel, Perez seemed to insinuate that it might have been because his view was that Wonder Woman was going to be a bit underwhelmed, considering that she was expecting practically a god and he noted that DC was a bit wary about making Superman look bad. I’m sure people would be glad to see an out-of-continuity version of that, George! Published January 08, 2014 by DC. Volume 8 - 1st printing. Collects Superman (1987-2006) #16-18, Action Comics (1938-2011 DC) #598-600, and Adventures of Superman (1987-2006) #439-440. Written by John Byrne, Paul Kupperberg and Jerry Ordway. Art by John Byrne, Jerry Ordway, Mike Mignola, Ross Andru, George Perez, Karl Kesel, Ty Templeton, Keith Williams, John Beatty and Dennis Janke. Cover by John Byrne, George Perez, Jerry Ordway and Dennis Janke. Superman's 1980s adventures continue with the introduction of Checkmate, plus appearances by Wonder Woman, Man-Bat and others. Softcover, 240 pages, full color. Cover price $16.99.